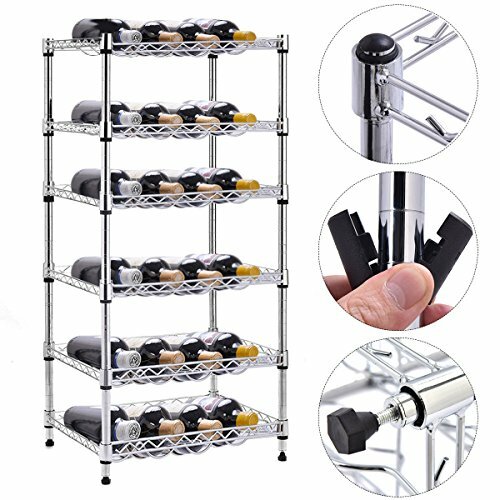 The 6 Shelves Mini Wine Rack Is Perfect For Any Wine Collecting Enthusiast. Each Shelf Has Specially Designed Contours That Elegantly Secures Your Wine Collection. This Organizer Is Constructed Of Steel Wire And Plated With Our Electroplating Chromium Treatment Which Provides A Soft Bright Metallic Finish. Don't Hesitate To Buy It! Brand New And High Quality Great For Displaying And Storing Your Favorite Wines. Holds 24 Wine Bottles Snug And Secure. If you have any questions about this product by Prosperly, contact us by completing and submitting the form below. If you are looking for a specif part number, please include it with your message.